The president said that he never complained about the lack or absence of powers. 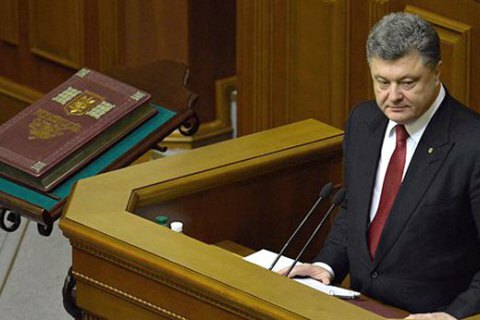 President Petro Poroshenko has spoken against amendments to the constitution to suit specific politicians' needs. He said this in Constitution Day speech, according to Interfax-Ukraine. "It is impossible to change the political system, the form of government, the state order according to the current state of affairs. It is impossible to change the constitution for specific individuals. This is the Basic Law of Ukraine," he said. "The political elite of Ukraine, in my opinion, is not sufficiently respectful and does not behave very carefully with the Constitution, which became one of the causes of those crises and trials of our state. I am sure that this should become a serious lesson for current and future politicians," he added. "Over the years, I have never complained about limitation or lack of authority. No matter how hard it is to respond to the unprecedented complexity of the internal and external challenges, I have never asked for empowerment," Poroshenko said. In February, Prime Minister Volodymyr Groysman called on parliament to endorse constitutional reform where it concerns decentralisation and the powers of parliament and the president. In September 2017, the prime minister said he did not need new constitution.